This entry was posted in Campaign stuff, Health and Safety Executive, Health Service Journal, HSE, HSJ Awards, NHS England, NHS Improvement, Sloven Health, Southern Health NHS Foundation Trust by sarasiobhan. Bookmark the permalink. I am lost for words. How people like KP et al, get away with it is beyond my capacity to understand it. I just wonder if it is that I am just too naive to understand how people play politics. That KP has her hands literally covered with blood and still gets to be defended and protected by some. Literally WTF!? Percy’s audacity certainly knows no bounds! Well done on “You and Yours”, Sara. What a pity the deaths of 1300 people get less airtime than an advertising feature for Chinese wine! The NHS holds noone accountable for any mistakes, negligence etc. It’s all buried and deleted from records once a person is basically murdered. Thier improvement of electronic records only benefits them, not the TRUTH. PERFECT EXAMPLES OF FRAUD AND ABUSE. 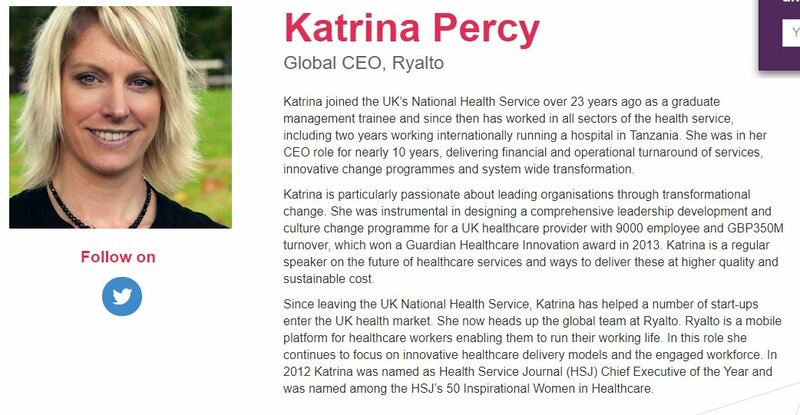 Notably, Percy is not using this name in relation to Ryalto Ltd. Companies House records show her using her married name – KATRINA SARTI. Conversely, in another company – BELFORTE LTD – she still uses her maiden name. I wonder if this is legal – one of the purposes of the Companies House Register is to identify what other directorships are held by individual directors. Using different names defeats this. There is an iceberg of silent pain from damage done through avoidable mistakes and or incompetence – in both LA’s and NHS. Only the tip of this is showing – for most people are too deep in anxiety, or grief – are unaware of any route to real relief – the truth and or accountability, when the worst happens. LA’s seem free to avoid all responsibility where their people fail. The ‘pass the Leader’ revolving door is well oiled. And the LGO ”does not intervene in HR issues”. But – what are NHS Trust’s Chairs and Non Execs doing? They are there only – to ensure effective Governance – and when necessary to bring the whole Executive to account ? They have full powers to hire, examine and fire Execs. – but currently – they do/dare – not. If they try to do their real job they can be bullied out – or have a very short tenure in the Non Exec role. Well qualiified people who try to do the job can leave very speedily – in despair. As well as Non-Executive Director, the acronym NED has a medical meaning: NO EFFORT DETECTED (applied I assume to patients in a coma or worse). Easy to confuse the two!